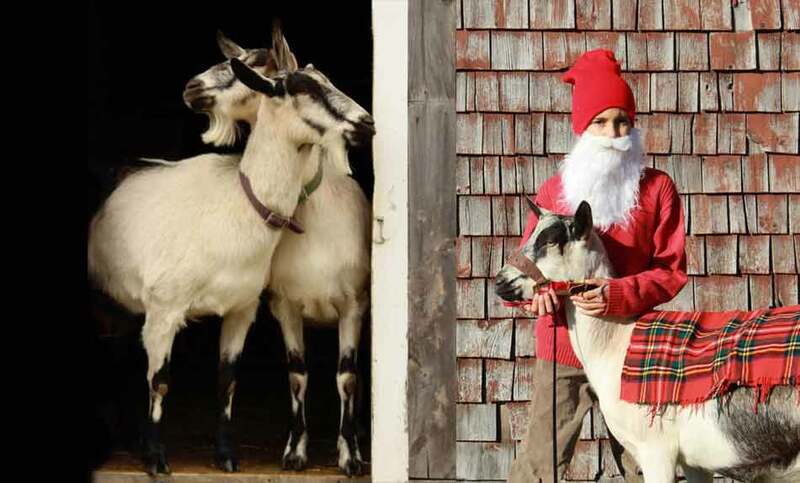 In Scandinavian tradition, the Yule Goat brings presents to children at Christmas, accompanied by the Tomten, a farm gnome who looks after the well-being of the animals. Our very own Yule Goat and Tomten will be visiting with children between 11 – 2, with stories, crafts, and a special Christmas hike to decorate our wild bird tree. After a visit to the barn, browse the local crafts and farm-fresh treats at the farm’s holiday market. All our products are made by local artisans and reflect the beauty and bounty of nature, from wooden bowls to hand-knits, skin-care products, and jewelry. Our edible treats include cajeta (caramel sauce), smoked gouda, local honey, and squash, pumpkins and other veggies for your Christmas feast. Bring your walking boots (and a sled if it’s snowy) to enjoy the beauty of the farm’s hills and fields in winter; we’ll have a fire and a wassail bowl to warm you inside and out! For more information, visit www.pumpkinvinefamilyfarm.com, email info@pumpkinvinefamilyfarm or call (207) 549-3096. 217 Hewett Road, Somerville, ME 04348. Find map and directions here.